Two people, a bus, and a gift. A couple of weeks ago, I had an exciting experience. As I have mentioned before, I am a licensed minister. Part of that calling for me is that I get to do lots of weddings. It has averaged out to roughly 35 weddings a year for the last 5 years. 2018 is starting to look promising as well! Or, I will get recommended by the venue, photographer, or even the DJ. Almost always, I will get an email from the bride (grooms make the initial contact about 10% of the time). And so the process begins. So, when I received an email from Christian Visholm (one of the 10% grooms), I was not surprised. Until I read that he was from Denmark. Denmark…as in Europe! Here is a link to catch the short news story about it. Couple from Denmark flies thousands of miles to marry at Lambeau Field. It was a truly great experience that will be a fun story to tell for many years! The graphic was something relating to the Green Bay Packers. This town, Green Bay, really loves their Packers. To say that there are Packer things everywhere is not an exaggeration. The Worth – There is a verse in the bible that could truly be the entire summation of God’s Word in just one sentence. John 3:16. “For God so loved the world that He gave is one and only son and that whoever believes in Him will not perish but have eternal life.” My paraphrase. Underline is mine also. Again, people in Green Bay, Denmark, or anywhere else on this earth, love their football team. They are passionate about it. But God so loved the world. To me, that describes passion more than anything else. He gave us the gift of His son. Pause and meditate on that gift. Dwell on that love for a moment. Think about what He did for you. Wow! The Work – As with most truth statements in the bible, there has to be action involved. It is one thing to hear it but another thing to act on it. Your desire will drive your decision. Your craving will create your choice. Your pursuit will prove your passion. What is my passion? What’s yours? And what is going to be done about it? As you may know or have read in previous blogs, I am a pastor by God’s calling. This entails many things but the largest portion of my time goes to the weddings that I officiate. 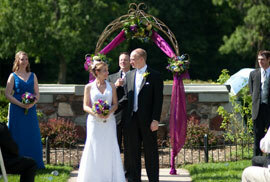 Here is an actual wedding of mine from Pamperin Park in Green Bay, WI. But before the couple and I get to this point, we will have met 2 or 3 times. Texting, calling, and emailing is also quite frequent . This way, the couple is not completely unknown to me and they also feel comfortable with me. There is a relationship. To be honest, I do not remember all of the couples I marry. Most of them have faded into a memory. But every once in a while, there is something special that takes place and a friendship is formed. The relationship continues. Of the almost 170 weddings that I have officiated, there are maybe 10 or 12 couples that I could call right now. We have kept up with life. But all of that is just background. Now you know a little bit of how my process works with these weddings. Monday night, I had a meeting with another couple. Their wedding is Dec. 26 this year. I have enjoyed our meetings and will also enjoy the wedding. They are a godly couple and so I feel like it is a privilege to marry them! In John 17, we find Jesus praying. He prays for himself (verses 1-5), his disciples (verses 6-19), then finally, all believers (verses 20-26). There are three things that Jesus is praying for in the second section, the one about the disciples. He prays for their Protection (11-12, 15). While on earth, Jesus was able to protect them. Now he prays for them to be safe by the power of God’s name. He prays for their Pleasure (13-14). The world has hated them but they can have joy inside them. The joy will be internal, not depending on the external. He prays for their Perfection (17 -19). Sanctify. To make whole. Perfection. The disciples would need to keep growing and learning. God desires this for the disciples so He had Jesus pray these things. CONCLUSION: I think God would desire these same things for a married couple. The marriage relationship provides an avenue in which God can protect, provide joy, and sanctify His children. The world does the opposite. In fact, without God and His word, we would become like the world. At that point, our marriage will be no good for God’s purposes. But if we keep God first in our lives and then our marriages, God will keep the marriage what it needs to be. And that is the difference this world needs. NOTE: If you are single, these three things can apply as well so don’t feel excluded or insignificant.